Our Manchester kitchen fitters will also do repairs and replacements of kitchen cupboards, doors, units, worktops and cabinets. We will undertake any kitchen fitting or repair job at your Home, Office, Hotel or Guest House including the replacement of appliances, sink, flooring and tiling. Whether you require a full installation service or just a simple repair or replacement of some kitchen units, we will provide you with a reliable service at honest prices. Our fitters are experienced carpenters who can work with pre-made materials or they can start from scratch and provide you with a bespoke design. 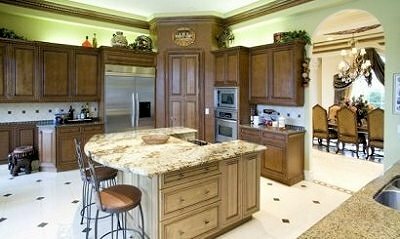 Our objective is to work with you in a way that brings you the ideal kitchen of your dreams. It may be small and low budget or something more substantial, either way we hope you will find our services to be absolutely top class. The Kitchen is the hub of any home and we take our work very seriously indeed. Most of our fitters are family men with wives and children and so they know the importance of getting things right. They won’t let you down! Kitchen fitting and repairs. Kitchen Tiling. Replacement of units and appliances. New Kitchen sinks, doors and worktops. Bespoke kitchens for homes, hotels & pubs Kitchen design and consultancy.